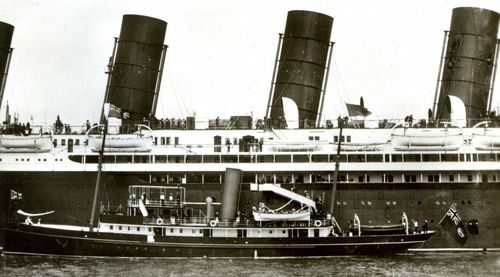 As my Queen Mary post suggested, I’ve always been obsessed with early 20th century ocean liners. So I may get more than a little excited when a photo appears that I haven’t seen before. You can tell it’s the first Mauretania and not Lusitania from a few different things, but most easily by the cowl-shaped vents. Lusitania had hinged canisters.